Tobiano is probably the best recognized white pattern. It is a dominant characteristic, meaning that if only one parent carries tobiano, the foal will have a 50% change of inheriting it. It tends to affect the legs, shoulders and hips, and leave the barrel of the horse colored. It can cross the top line and where it does, it will cross at the hip and shoulder first. Tobiano alone is thought to leave the face solid, but it is believed very few horses carry tobiano without having one of the other white patterns as well. There is only one form of Sabino that can be tested for, SB1, but many horses that exhibit phenotypical sabino markings test negative for SB1. It is not known at this time how many different genes may be expressing as what we call sabino. Sabino tends to affect the back legs of the horse first. It tends to leave chin white, and roaning along the edges of white markings, and sometimes scattered throughout the coat. Like any pattern, expression varies. At times, markings as small as a star are blamed on sabino, although in truth, it is difficult or impossible to tell what pattern a very minimal horse carries without testing. According to the current visual evidence, sabino does not cause blue eyes. Sabino, at least SB1, is an incomplete dominant gene, meaning that homozygous horses express much more white then heterozygous horses - hence the term "max white sabino." The only breed currently thought to lack sabino is the Icelandic Horse. 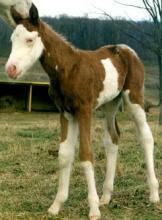 portions of this foal are typical of splashed white. Splash, or Splashed White, is theorized to be an incomplete dominant gene. Splash tends to leave white markings with even, well defined edges, almost as if the horse had been dipped in white paint, starting on the the head and legs. Blue eyes are common with splash, as well as bottom heavy or apron blazes. Splash is associated with deafness, but not all splash horses are deaf. It is thought that deafness is caused when splash inhibits pigment production in the inner ear. 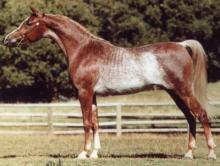 A well known AQHA stallion that exhibits the splashed white phenotype is Colonels Smokin Gun. UC Davis has now identified three (3) splashed white mutations. SW1 is the most common of the three mutations and horses homozygous for the mutation have been found. SW1 has been found in several breeds including the Icelandic horse. Considering the age and isolation of the Icelandic Horse it is probable that the SW1 mutation will be found to be wide spread especially in European and American Breeds. SW2 and SW3 are found in certain lines of Quarter Horses and Paints and are theorized to be homozygous lethal based on results in other species. The Frame Pattern tends to put color on the barrel and face of the horse, move horizontally, and leave the legs solid (although other patterns can add leg white). It also tends to leave white that is "splotchy," with jagged edges. It is well known to cause blue eyes, but not to cause roaning in the coat. The name "Frame" comes from the pattern's propensity to leave a "frame" of color along the outer edges of the barrel. The gene that causes the Frame pattern is known as Lethal White Overo and is lethal in its homozygous form, with the foals being born solid white and only surviving a few days. They are born without a functional digestive track, and unless euthanized, die in gastric distress. Because it is often hard to visually tell if a horse has frame (there have been cases of solid colored horses testing positive), it is important to test breeding stock in all breeds that carry frame in order to avoid producing a lethal white foal. Frame is an incomplete dominant characteristic and breeding frame to frame does not increase your chances of obtaining a frame foal; statistically, 25% of foals from frame-to-frame breedings will die, leaving 50% frame and 25% solid surviving foals. Breeding a negative frame to a frame will give 50% solid and 50% frame foals. By only breeding non-frame to frame you effectively reduce your chance of a dead foal by 25%. 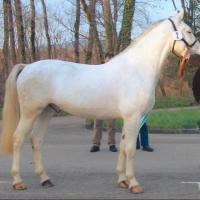 The confusion among some breeders is most likely the result of horses carrying multiple white patterns, such as sabino and splash, in addition to frame. Roan is a white pattern that leaves white hairs scattered throughout the coat. The amount of white varies seasonally, with the greatest expression in the spring when they start to shed and the least during the winter when it can at times be difficult to tell the horse is roan. 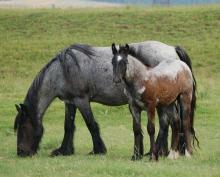 Roan typically leaves the legs below the knee, mane, tail, and head solid colored. It also tends to leave a characteristic inverted V on the lower legs where the roan pattern stops and the solid legs begin. Roan is a simple dominant characteristic and there are now know to be several different alleles that produce class roan phenotypes. The theory that roan is embryonic lethal when homozygous has been disproven by UC Davis's zygosity test, at least with the mutations (alleles) for which they are testing. 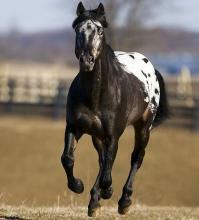 Leopard Complex (LP) is the base gene for all Appaloosa patterns. It is inherited in a semi-dominant manner and is responsible for appaloosa roaning and necessary for other appaloosa patterns to exhibit. In very minimal form, the horse may only show what are known as characteristics (sclera, mottled skin, and striped hooves on non-white legs) and even these can, at times, be so minimal as to escape notice. When LP is present along with a pattern gene (PATN), the horse will present with a blanket, leopard, or a pattern somewhere in between. Horses that are homozygous for LP and also carry a pattern gene will have white areas without spots. A blanket without spots is known as a snow cap, and a leopard without spots is known as a few spot. Horses that are homozygous for LP are also night blind. LP roaning (varnish) is progressive, meaning that the horse lightens as it ages. The difference between LP roaning and gray is that with LP roaning the bony areas and spots of the horse will stay dark so that the horse never turns completely white. Rabicano adds white hairs to the coat, starting at the base of the tail and the flanks. In minimal form, it can express as only few white hairs at the base of the tail. With extreme expression, it can extend up to the shoulders and even the chest of the animal. It can put white patches behind the ears, form striping on the barrel and put white hairs into the tail. The striping on the barrel seems to occur more often with rabicano than with other white patterns. Rabicano is sometimes referred to as a skunktail or silvertail. The inheritance of rabicano is not understood. White Spotting covers any of the 20 mutations of the KIT gene that are designated W. These mutations were formerly known as Dominant White, but Dominant White was bit of a misnomer as more mutations were discovered that caused less white. White spotting patterns can vary greatly in their expression with some causing an all white horse and others looking more like a single copy of splashed white (W20). Several of the White Spotting mutations tend to resemble maximum sabino in expression, but inherit as a simple dominant gene. Some of the mutations are believed to be lethal in-utero when homozygous but at least one (W20) is known not to be. There many lines of "sabino" horses (especially in Arabians) that are in fact now known to be White Spotting (W3) carriers. To date, there have been 20 different mutations of White Spotting discovered and more are expected. I have a varnish Appaloosa with spots. If I am reading this correctly she is also PATN n/n. Which is correct per her DNA test. My question is: IF she is PATN n/n shouldn't she not have spots??? If she is bred, do I need to make sure she is bred to a few spot or a leopard???? The PATN test is new and I am still trying to get a full understanding. She was born a bay /blanket w/spots. Shouldn't that have tested out as PATN? Or does the Varnish nullify the markings?? ?